Early Learning Centers offer a parent and child education program to low and moderate-income families. This program is funded by the California State Department of Education and First 5 of San Luis Obispo County. 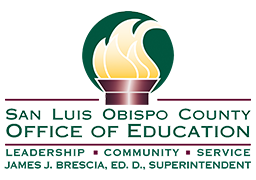 The program is administered through the San Luis Obispo County Office of Education. Physical development – small muscle and large muscle coordination skills. Dental, nutrition and safety education. Emotional and social development through play with other children. Breakfast or a nutritious snack is provided daily through the Child & Adult Care Food Program. Child-directed activities to develop independence, problem-solving, decision-making and creative thinking skills. Teacher-planned activities to expand the children’s interests and knowledge. Language development and communication skills. Cognitive development – pre-academic skills for reading, mathematics and science. Focus on the important role parents play in their child’s education. Build supportive relationships with other parents and teachers. Listen to speakers on topics such as positive discipline, health and nutrition, preparing your child for kindergarten, first aid, child safety both indoors and outside, etc. Learn about physical, cognitive, emotional, social and creative development of children. One of the most important aspects of our program is “parent education and involvement”. Classroom Hours: 8:30 a.m. – 11:30 a.m.
Classroom Hours: 8:30 a.m. – 11:30 a.m. & 12:30 p.m. – 3:30 p.m.
Classroom Hours: 9:00 a.m. – 12:00 p.m.
Classroom Hours: 9:00 a.m.-12:00 p.m.
Classroom Hours 8:15 a.m. – 11:15 a.m.
Classroom Hours 8:15 a.m. – 11:15 a.m. & 12:15 p.m. – 3:15 p.m.
Classroom Hours 8:00 a.m. – 11:00 a.m.
Classroom Hours: 8:00 a.m. – 11:00 a.m.